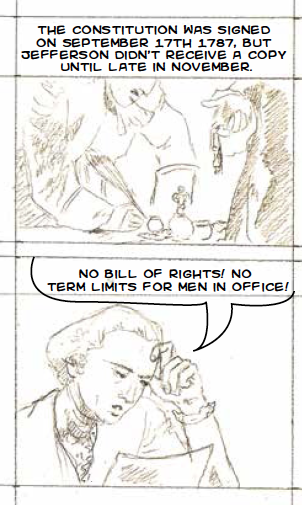 We’re not sure if any of the major card companies make Constitution Day cards, but Smithsonian Exhibits graphic specialist—and comic book artist—Evan Keeling created two eight-page mini-comic books for the holiday. The comics will be handed out this upcoming Friday and Saturday as part of the National Portrait Gallery’s Constitution Day Weekend. Constitution Day, appropriately enough, commemorates the signing of the Constitution on September 17, 1787. 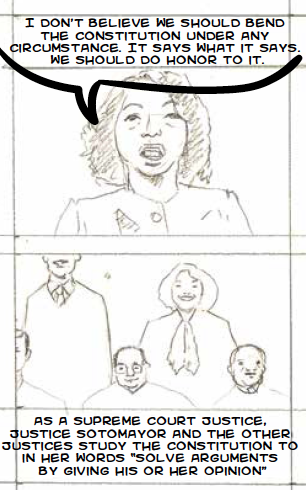 These previews are from early in the comic making process. The final versions will be in full-color. …. and one founding father. Spoiler Alert! He succeeded in getting that bill of rights. In addition to handing out Evan’s mini-comics, the National Portrait Gallery will also run a family program where participants can make their own mini-comics. If you want to know more about making comic books, you can read about the process Evan used to create the Captain Capture comic book for the Smithsonian’s Digitization Program Office here.